I woke up early this morning -- very early. My daughter and her husband are hiking in France and called us -- forgetting the time difference. Yawn. Couldn't get back to sleep. My mind had pinpointed something wrong with the last chapter of a book I'm working on and wouldn't let me go back to sleep. Don't you just hate it when a story is nagging you like that? So, just to stop the nagging, i got up and re-wrote that last chapter from a completely different point of view. hmmm. much improved. nagging stopped. I tried to get back to sleep. But all sorts of alarms kept ringing. My husband's. The 8-year old's. And finally, mine. 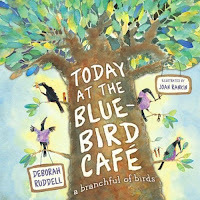 Today at the Bluebird Cafe: A Branchful of Birds by Deborah Ruddell. Illustrated by Joan Rankin. Margaret K. McElderry Books, 2007. Funny, thoughtful, and lyrical short poems about birds. Anyone who has seen these birds in action knows this poet has captured them beautifully. Describing the Cardinal in one word -- valentineSantaClaustotallyred. Yup. That's the color of a Cardinal. Rankin's watercolor illustrations sweep across the page. The Eagle needs a double page spread to capture its flight. And the tostled head Kingfisher is a "blue-streakin' flash" as he dives from one page to the other, catching fish. "It's all-you-can-eat at the Bluebird Cafe," so enjoy. Wow. Talk about international publishing. The author lives in the USA and the illustrator lives in Johannesburg, South Africa! As I write this, The Bluebird Cafe is a bargan book at Amazon.com. If you hurry you can get this normally $15.99 book for just $6.99. What a deal! For more Nonfiction Monday entries, click here. This is probably going to be the last Poetry Monday -- until next April. Next month I'll go back to doing Nonfiction Monday book reviews and articles. However, if you want to know what I've been doing in the nonfiction area lately, just check the previous post. I spent the weekend working on nonfiction stuff. Got two more copies of a manuscript ready to be mailed on Monday. This time I made sure that not only was the manuscript enclosed, but also a synopsis, an outline, a timeline, a long bibliography, and multiple chapter notes. I was all set to mail it on Saturday afternoon, but when I got to the Mail Stop (store), they had just closed. On Sunday, after recovering from the rain-induced headache, I polished up another manuscript, discovering to my surprise that it was closer to being ready to send out than I had supposed it was. I should be able to send that one out on Tuesday. What with getting most of the laundry done and being able to make beef stew for the family, it was a most successful weekend. Now, for my next miracle, I need to get out in the flower border and dig up the thistle that thinks it belongs there. When I go to ALA, I'm right in there with everybody else picking up the goodies the publishers and tech people hand out. A lot of the goodies I'll use as prizes during the library's Summer Reading Program. Others I keep for myself. --sun screen lotion in when ALA was in Florida? sure. --pencils? pens? rulers? other office supplies? great! What do you mean, cell phone? I passed this one by several times before I actually picked one up. Through the packaging I could see what looked like a pool of lip gloss or chapstick. "Oh cool," I thought. Just the thing the 8-year olds at my library and my 8-year old at home would love. A play cell phone full of chapstick. This whole past week the 8-year old had been waking up early because she wanted to go early to the before-school daycare with my spouse. Because she was making something special for Mother's day and needed the extra time there. Meaning I could sleep in and take my time getting to work. Yesterday I was awakened by a crying 8-year old. And an irritated spouse who told me that I would have to take the 8 year old to before-school daycare because he wasn't going anywhere with this painted lady. When I finally took a good look at her, she was indeed highly made up. Bright red lips/ rosy cheeks/ eyeshadow. hmmmm. where did she get her supplies? Many tears. How could we tell she had makeup on? After a good scrub with Noxima (TM) and a long talk about how we older people used makeup so that we could look like she already looked, I finally managed to get her to daycare and me to work. I'm going to have to take a good look at the rest of these ALA goodies before I hand them out to children this summer. Fiona Bayrock over at Books And 'Rocks has tagged me with something a little different---a book meme. Okay. Put down that Adult romance book. What Children's book (or YA) would have that many pages? In my "you gotta read this next because you are bootalking new books when you go to the schools in May to advertise the Summer Reading Program at the library" pile -- is -- AS IF BEING 12 3/4 ISN'T BAD ENOUGH, MY MOTHER IS RUNNING FOR PRESIDENT! by Donna Gephart. The title caught my eye what with this being presidential election year and a woman is running, etc., etc., etc. you lose = there is no fifth sentence on this page. It's the end of a chapter and has only three sentences on the page. Will it count if I quote those sentences? "We walk out together, Mom with her shoulders back and Grandma with her head held high: Team Rothrock. We walk right past those nosy reporters and get into the car. And even though I just lost the Regional Spelling Bee because of a cookie, I feel surprisingly good." page 123 (or close to it) is a turning point in this book. I wonder if that happens in other longer books? nobody right now -- I have to put a kid to bed. I'll think about who to tag, later. It turns out that this week, which is National Library Week, is also Young Person's Poetry Week. And today, Thursday the 17th, is National Poem in Your Pocket Day. So remember to print or write something out and put it in your pocket so you can pull it out and read it to everyone you meet today. Many writers write multiple books under pen names. They have various reasons for doing this. -- 1) They write several books a year and their publisher doesn't want the books competing with each other. -- 2) They write very different types of books under separate names -- such as nonfiction under one name, Adult Mysteries under another, and Children's books under a third. -- 3) They have writing partners and decided to combine their names. There's an adult writing team that took the first names of each writer. (It might be Fern Michael, I can't remember.) And then there is me. Some years ago, two writer friends and I wrote several books together. We did it for fun -- but when we were done, we liked them so much that we sent them out to publishers. Rejections, and rejections, and finally they were accepted. When it came time to decide on the author's name, we tried several things. Putting all three names on the cover and spine just wouldn't work -- no room. So we tried mooshing our names together. Mary W. Wirths? No good, I said, knowing from my librarian experience that the books at the end of the alphabet were not checked out as often as the books in the A's and B's. Publish it under one of our names? Not fair to the others. And shortened Mary's Last name. Really, really short. Great idea -- this puts the books right between the Berenstain Bears and Marc Brown's Arthur books! Yes, another Nonfiction Monday featuring poetry. 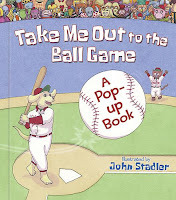 Surely everyone has, at one time or another, sung that wonderful baseball song, "Take Me Out to the Ball Game." Written by two guys who had never been to a baseball game, it has become the theme song of the event. Beary Bonds says, "A honey of a home run, this is THE book to break hibernation for!" Just in time for baseball season, a perennial favorite. Kelly Herold, who blogs at Big A litte a, is also the editor of the online magazine, The Edge of the Forest. The March/April 2008 issue of The Edge of the Forest is now available -- here. Spring Book Recommendations from the Editorial Board. Fairytale in the Forest: A Friendship, by Candice Ransom. A YA Review Bonus Section. Sounds from the Forest is back. If you're interested in submitting an article or review, please check out the About Us page for details. The next issue of the Edge of the Forest will be out the first week of May. p.s. And after you read the magazine, whip right over to Big A little a to enjoy an interview with Scaredy Squirrel and his creator, Mélanie Watt who are touring various blogs this week.